What is the occupy movement all about? To me, it’s another reason to sell newspapers, waste gas on media trucks going to the so-called camps where protesters are. They want the ‘Robin Hood tax’ back. But Robin Hood wasn’t wasting natural resources to come up with ‘witty messages’ on billboards, he stole from the rich and gave to the poor. “Ms. Frakes is now unemployed, living on $330 a week of unemployment benefits and odd jobs,” the Journal wrote.” is the one quote that attracted my attention from an article on the occupy movement. The activists in the Occupy movement proclaimed themselves the 99% of the population, the poor ones that have been hit by the economic downturn in an imaginable way.2.8 billion people earn under $2 a day, that’s almost half of the world population, and people in front of St. Paul Cathedral in London argue against capitalism and claim equality. Equality they say, but would they like to be equal with the ones mentioned previously who earn under $2 a day, or has equality gained another meaning since I first learned it means fairness, similarity, equivalence? matter is concerned we are in total agreement. In a recent confession to the Commons liaison committee he said: people shouldn’t be able to erect tents all over the place. Protesting you should do on two feet, rather than lying down in some cases in a fairly comatose state. Going back to the 99% issue, in order to be in the top half of the globe on the distribution order, you need to earn around £1000 a year. Yes, that is 3 zeros, one thousand and I did say per year. Don’t take my word for it, take World Bank economist Branko Milanovic’s word, author of The Haves and the Have-Nots (link to the .pdf version of the book). 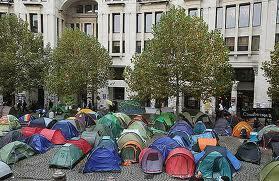 Would the real 99%, the ones who would be entitled to call themselves poor, afford to buy or rent a tent? Not for the purpose of occupying the London Stock Exchange, but to live in it. What made me write this article and why am I against this movement? 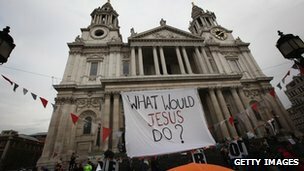 Because my earnings last year were under £2000, so I am more entitled to saying I am part of the poor ones, but I would never stay in front of St Paul’s cathedral with big brightly coloured banners hoping this would make things right. Instead of that, I’m working hard towards getting my degree and making contacts so I can earn the money I want and deserve. So, can someone tell me what the whole point of the movement is, other than a gathering similar to the ones in the Flower Power era?